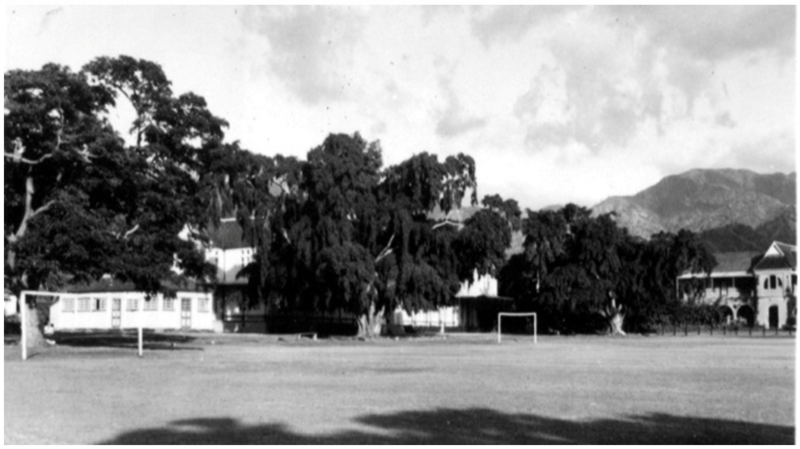 In 1953 the students at JC came from all over the island, and many of those outside of Kingston & St. Andrew were boarders. They arrived in Kingston at the beginning of each term by train……. 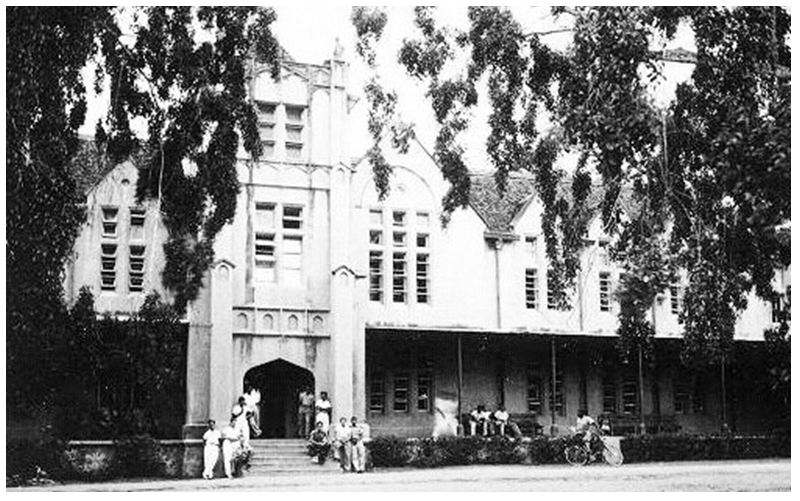 Up until the 1970s, the school’s entrance was the gate closer to Matilda’s Corner, as the other which is now the Main Gate, was not always opened. 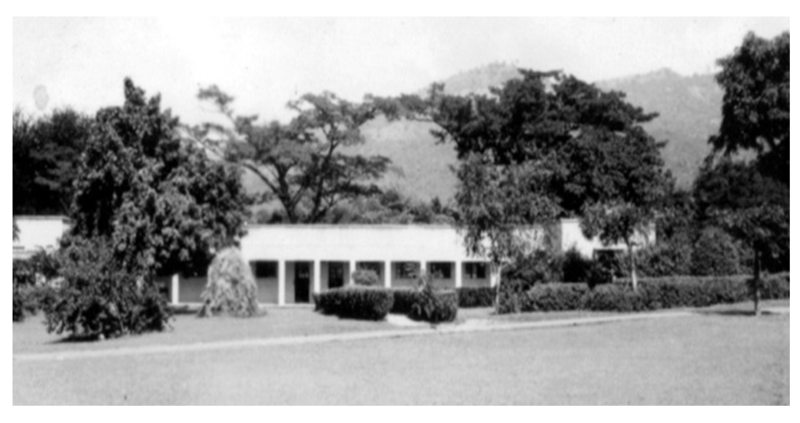 The first building that one passed was the Lower Form rooms for 3rd-6th Forms, and where the Headmaster’s office was also situated. then the Biology Lab (not shown), and the Chemistry Lab (at left of photo below). 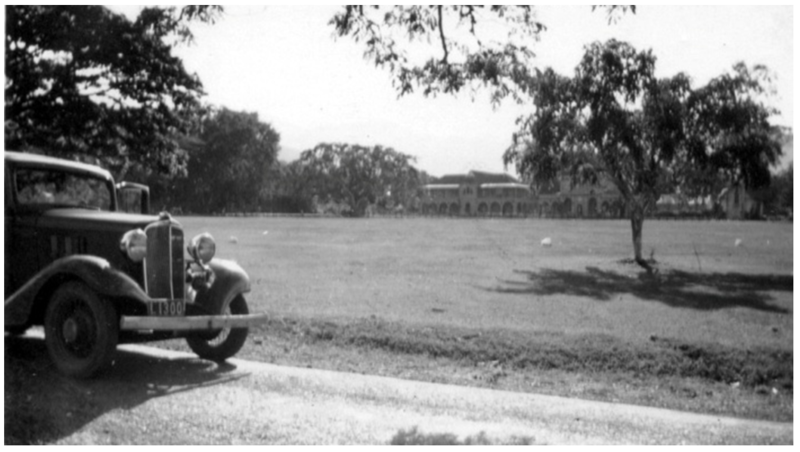 Immediately beside it was Simms Building, with the famous Ficus trees in front. Scotland House is shown at the right of the photo. Simms and Scotland were the senior boarding Houses. The school’s Infirmary, below, was located behind the Chemistry Lab. Students are shown at the entrance of Simms Building, which was named after Archdeacon William Simms, Headmaster when it was built. It was constructed with masonry and timber and it exhibits a combination of Gothic and Georgian features; the projecting central tower and wings are reminiscent of Georgian designs, while the façade’s soaring verticals, griffins, and pointed arch openings, are Gothic. Construction of the building was completed in 1885. 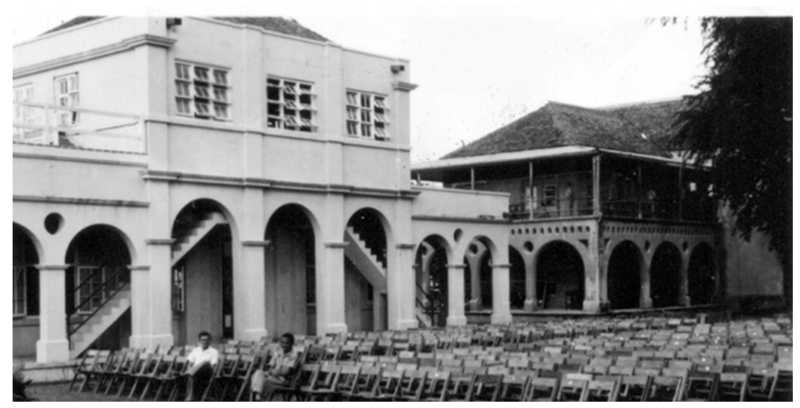 It was designed to accommodate boarders as well as day students, and was large enough to hold the whole school at that time, without difficulty. 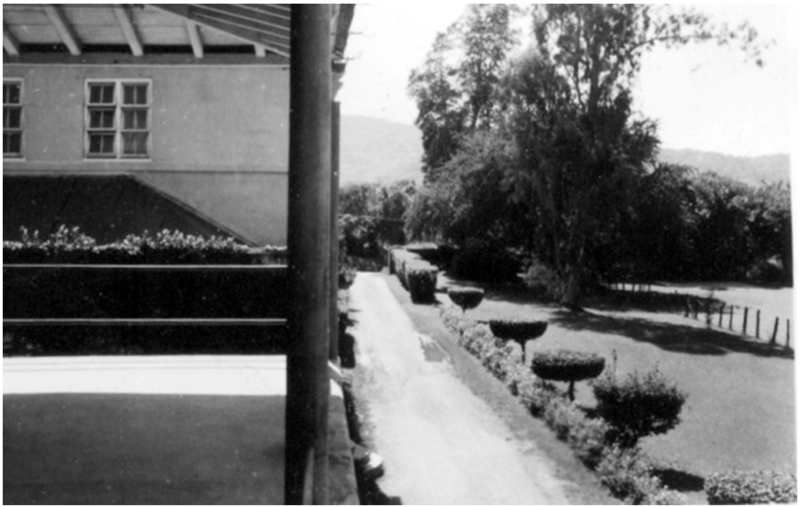 In the 1930s-60s the building had the school’s dining rooms on the lower level, and the dormitories of Simms House above. The Building also included the quarters of the Housemasters of Simms and Scotland Houses as well as other masters. 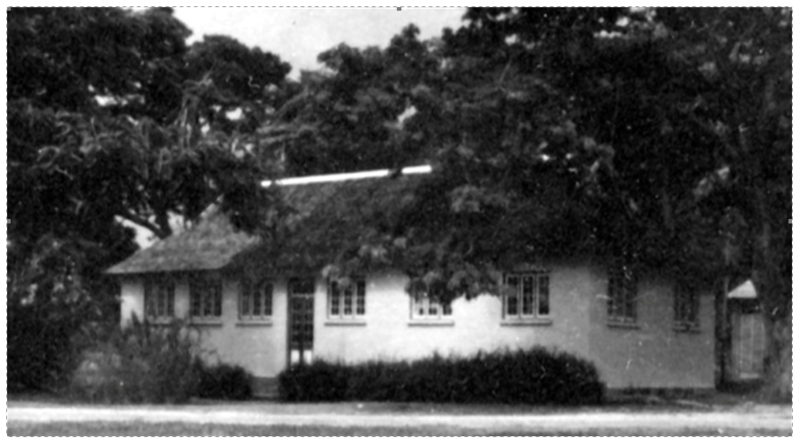 After the boarding facilities were closed in 1967, it has housed the Principal’s Office, administrative offices, staff room and sixth form classrooms. 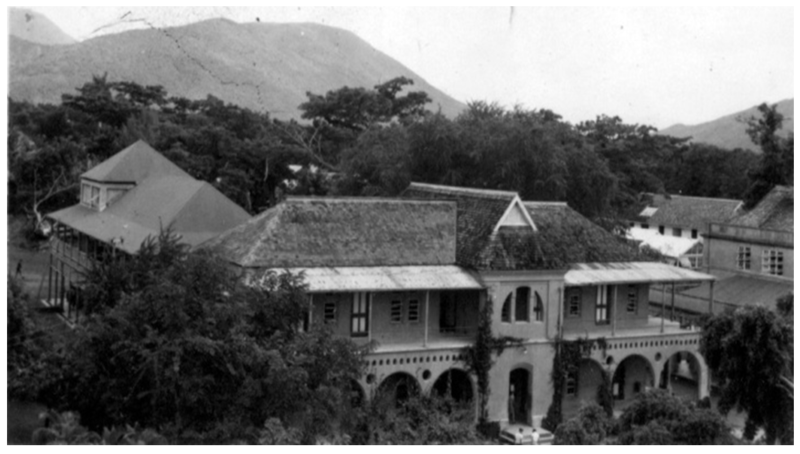 For over a hundred years, Simms House has been the main building of Jamaica College, with its strength and durability repeatedly demonstrated by its resistance to hurricanes and earthquakes, including the disastrous Kingston earthquake of 1907. At that time the only “casualty” suffered by the building was the loss of its dome, which was between the griffins on the main tower. 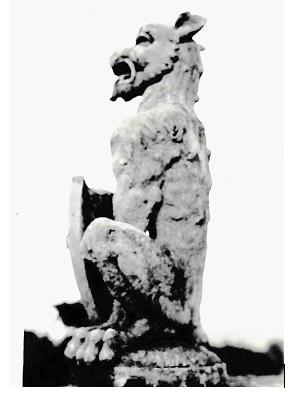 A close-up of one of the griffins is below. 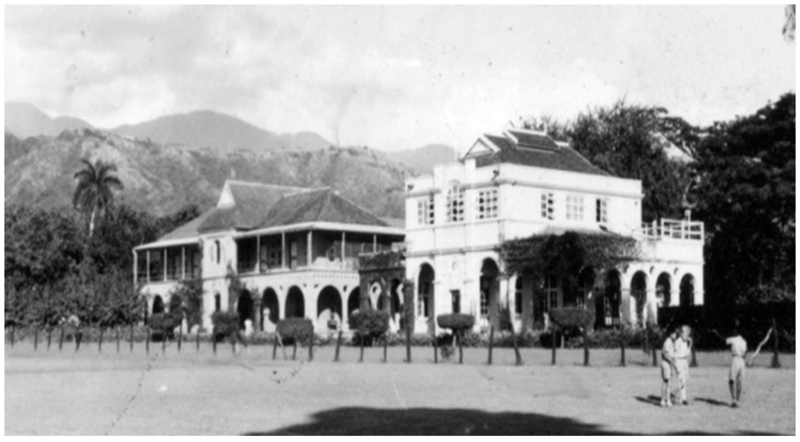 The Assembly Hall, built in 1913, is beside Scotland House. The Geography Room, complete with outdoor weather station (at upper right of photo), was upstairs this building, while the downstairs was used for classes, student assemblies, and writing School Certificate and Higher School Examinations. 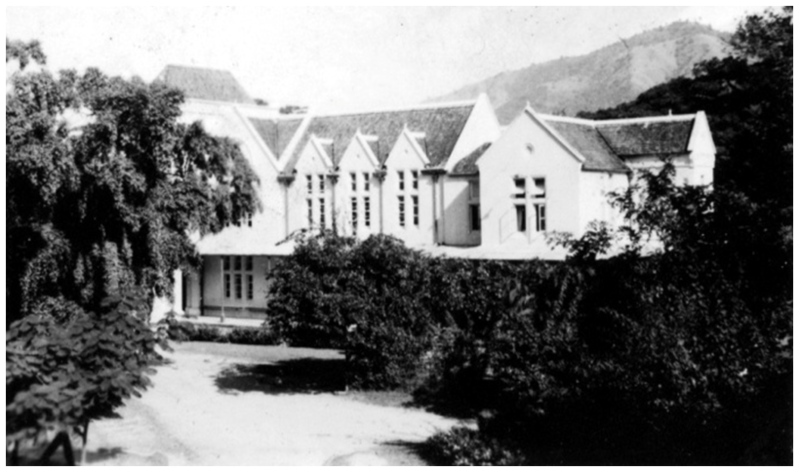 The road between Scotland and the Assembly Hall led to the school’s Gymnasium, Woodwork Shop, Swimming Pool, Tuck Shop, Tennis Courts, and Hardie House (Hardie East & Hardie West), which had a shooting range behind the building – where the Matalon Dormitory now stands. 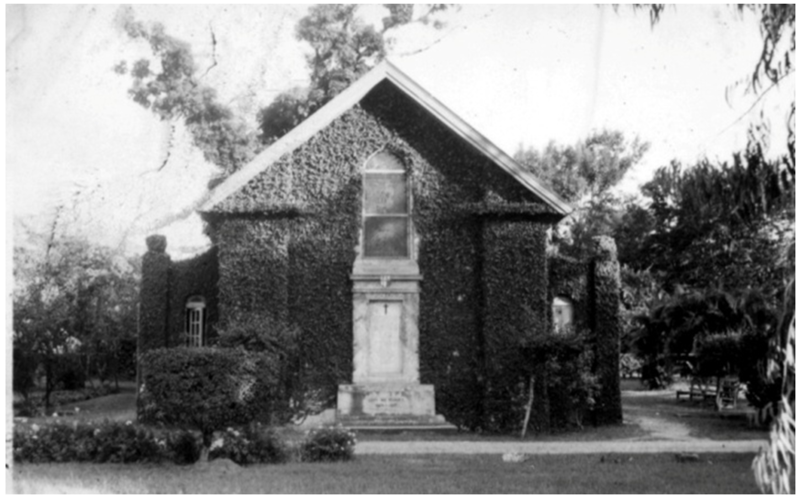 St. Dunstan’s Chapel, the last of the buildings which form a semi-circle around the playing fields, was dedicated on November 11, 1924, at a ceremony attended by the Governor of Jamaica, staff, students and friends of JC. The Headmaster, Mr. William Cowper, announced that the east window is a replica of the St. Dunstan’s window at Canterbury Cathedral in England. The Chapel was built to commemorate the sacrifice made by the seventeen old boys who died in the First World War. Their names are inscribed on a tablet at the western exterior of the building. Another tablet inside, near the altar, honours the ten old boys who died in World War II. There are, as well, plaques in memory of Mr. Cowper and Mr. James Waterhouse, both of whom died in 1939. Also, the adjacent Chapel Gardens offered places for quiet study or contemplation. Morning prayers for all students other than those who had other religions took place on weekdays, and school announcements were sometimes made by the Headmaster or senior Housemasters. An Anglican communion service, with hymns led by the School Choir, was also conducted on some Sundays. 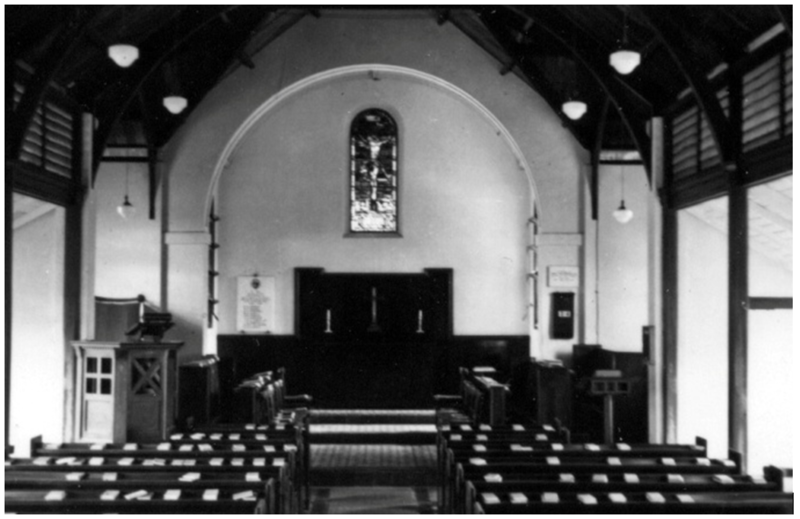 The Chapel has also been used by Old Boys for their marriages. The grassed rectangular area between the road beside Scotland House, the Assembly Hall and the Chapel, on the East and the playing field on the West, was called “Holy Ground” and was restricted to the use of the prefect body. 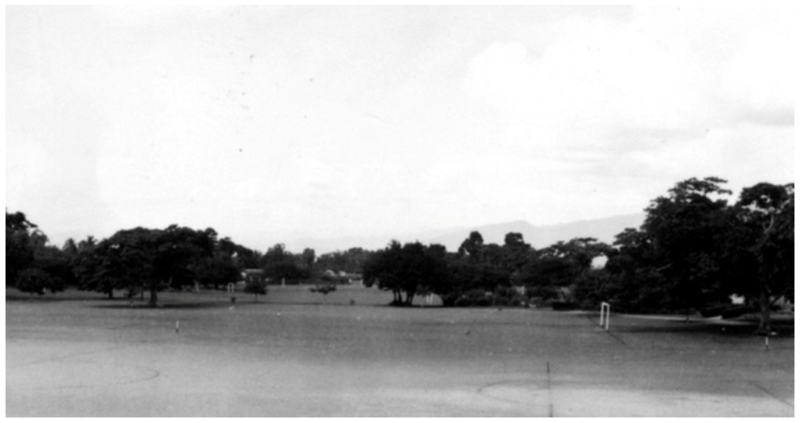 The view below, taken from the veranda of Scotland House, shows the playing fields, on which Track and Field events, Cricket, Football and Field Hockey games took place, in the foreground. That was also where the Cadet Corps had parades. In the distance were the Lower playing fields, where the new Ashenheim Stadium is now situated. 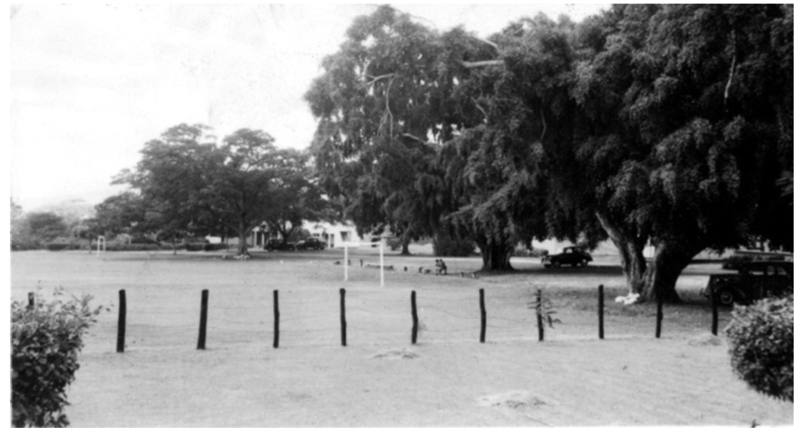 Boarders, particularly, will well remember the divi-divi tree at the centre of the photo, where the “Fudgeman” was allowed to sell frozen confectionery from an icebox mounted on the back of his bicycle.